Everyone agrees that Social Security's future is in jeopardy--or is it? Long viewed as the "third rail" of American politics, Social Security is a major political issue, and many experts and politicians would like to restructure this program. But too few of us, young and elderly alike, really understand the origins and workings of this popular program. Daniel B land answers the call for objective information with a short history that provides context and clarity for the current debates. Covering six decades through the beginning of the current century, B land chronicles how Social Security and the controversy surrounding its solvency have evolved, offering along the way new insights into its past, present, and future. His balanced perspective will help readers understand and evaluate partisan arguments on both sides of the issue. 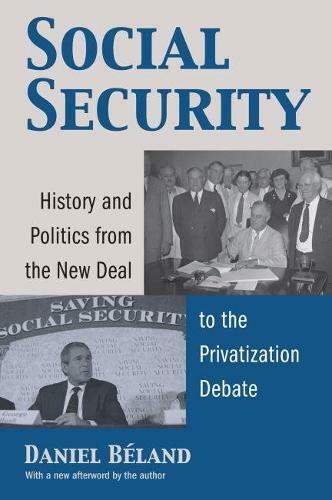 B land reconstructs the political history of Social Security, describes the impact of subsequent amendments to the original act, and offers comparative insights from other countries that can improve our understanding of the debate. He focuses particularly on the relationship between ideas and institutions in policymaking to examine the impact of gender and race on Social Security politics; and he shows that gender has had a more direct impact on Social Security development--especially regarding spousal benefits--and is more important in understanding the politics of reform than has often been understood. In assessing how Social Security has been sold to the public, B land reveals how the 1935 act resulted in part from its link with the traditional American belief in the values associated with hard work and self-reliance, while surreptitiously providing some economic security for the impoverished. Today's privatizers argue for changing from a guaranteed benefit to a defined contribution program, seeking to reclaim from liberals the rhetoric about American values in order to alter the very nature of Social Security--effectually turning discourse centered on personal and collective gain against the institutional legacy of the New Deal. Succinct and illuminating, B land's work provides concerned citizens with a thoughtful exploration of how the politics of Social Security evolved, while offering scholars new theoretical insights about the welfare state and the role of ideas and institutions in policymaking.